a unique night of comedy, poetry and short film curated by Elissa Ball on Thursday, it's a variety show like you've never seen before. Friday we're happy to have Columbia City's own Lary Barilleau and his Latin Jazz Collective on our big stage. Bring your dancing shoes! 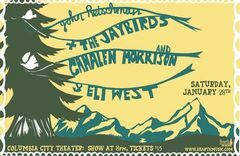 On Saturday we're excited to welcome back old-timey duo Cahalen Morrison & Eli West, who are some of the best pickers making music today. These guys have eschewed staying on Ballard Avenue to play to sold out crowds in Europe instead and we're lucky to welcome them back to our stage. Last but not least, we'll be ending our week on a high note Sunday with St. Paul de Vence's CD release show with the talented Gundersen family project Le Wrens and special guests "Bonfire So-So."